Hello everyone! 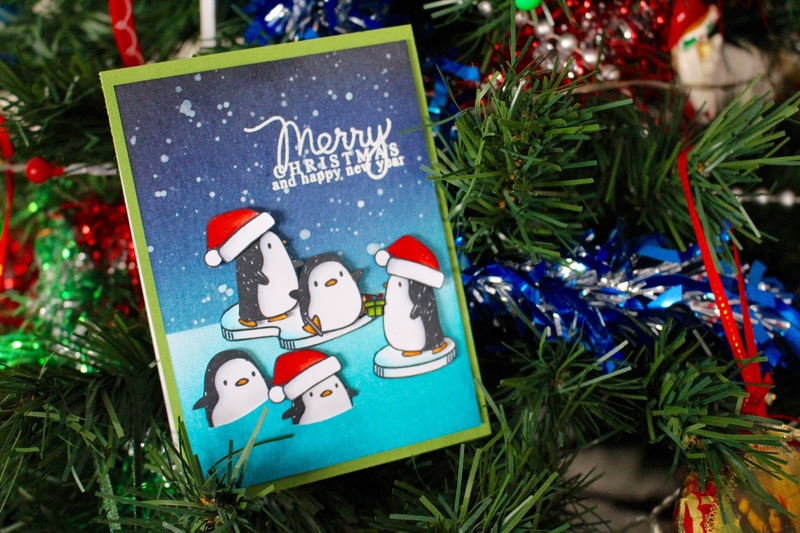 Today I'm here with Day Thirteen of my Christmas Card Series for 2015. Today I'm using a lot of the same product I've used in previous days, so which means a lot of Mama Elephant, Copic Colouring and Distress Inks. So basically I started off my card with stamping out all of my images with Memento Tuxedo Black ink onto my Neenah Solar White cardstock. 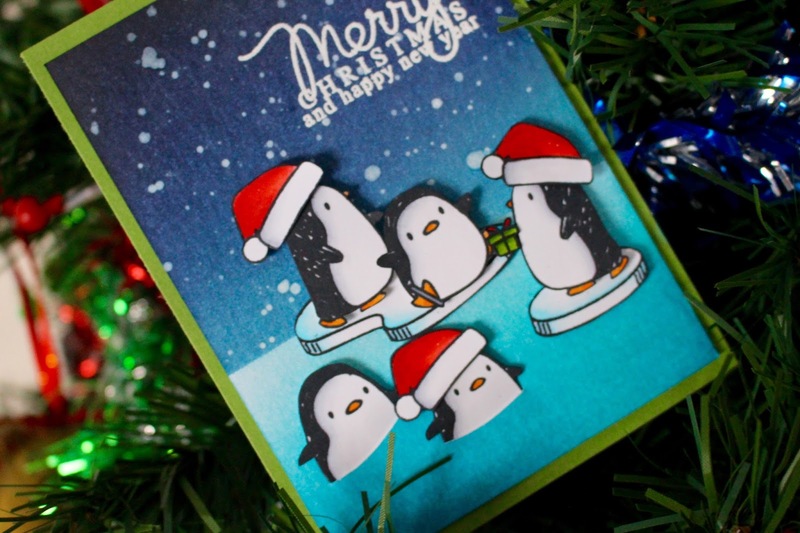 I used the Arctic Penguins and Cozy Christmas by Mama Elephant for these. I then coloured them all in really simply with some Copic Markers - it didn't take as long this time as the penguins have very minimal colouring involved. Once they were all coloured in I then cut them out with my scissors and outlined them with a marker to make them look perfect. Once they were coloured and cut I worked on the background. I pulled some more cardstock - this time it was Tim Holtz Watercolour Cardstock and I did some ink blending. I first masked off the top half and inked up the bottom using Tumbled Glass, Peacock Feathers and Salty Ocean and then worked backwards to blend them all together. I then masked off the bottom and inked the top half using Tumbled Glass, Broken China, Chipped Sapphire and Black Soot and again then worked backwards to get an even blend. I then took my favourite white mist and dropped some mist onto my background to make it look like snow. I then heat set this as I was then going to heat emboss my sentiment. I grabbed the 'Merry Christmas' sentiment from Merry Greetings also by Mama Elephant, prepped my cardstock piece once it was dry with an antistatic bag and then stamped my sentiment with Versamark ink and coated it with White Embossing Powder and then melted the powder with a heat tool. Then it was time to arrange my card, I first took all the pieces and put them onto my card to get a good idea of placement. Then for the two penguins 'swimming' I grabbed a pencil and a craft knife and just measured and put a mark with my pencil around there bellies and then I took my craft knife and cut a slit from each mark to create a slit. I then pushed each penguin through and taped them at the back. I then adhered the rest of the penguins and accessories with foam tape. I then took some green cardstock, adhered it down flat to my card base and then foam mounted the main panel onto the card base as well and that basically finished my card.